Uzbeks claim that their national cuisine boasts three hundred different kinds of pilaf, orplov. If so, then I probably won’t live to taste them all—to my regret, since a well-made pilaf is one of the great rice dishes of the world. But I have feasted on at least one of the best, the fruit­laden pilaf offered here, a gift from Glenn and Asele Mack. Glenn has been studying Central Asian cuisine ever since he met Asele, whose relatives hail from Uzbekistan; he even worked for a time with an Uighur noodle master in Kazakhstan. 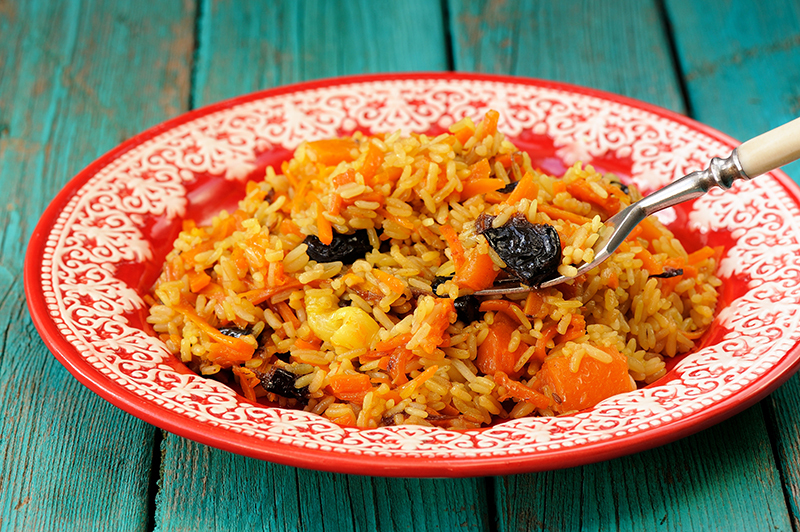 With its rich assortment of fresh and dried fruits, this pilaf is generally reserved for special occasions. Glenn and Asele were regaled with it in a small Kyrgyz village after a rigorous 15-hour bus ride over the Tian Shan Mountains. To make this dish accessible to Americans, I’ve taken a few liberties with the ingredients. Normally, scarlet barberries would be used instead of lemon juice to add tartness and color (they’re also prized for their high vitamin content). Uzbek cooks favor yellow carrots, which are somewhat less sweet than the orange. Their local black cumin seed is stronger than ours, and quince are readily available throughout Central Asia. But despite my modifications, this pilaf is a lavish way to regale guests, whether they’ve traveled 15 minutes by highway or 15 hours overland. Soak the chickpeas overnight in water to cover. Drain before using. Heat the oil in a large wok. Add the onion and fry over medium-high heat for 1 to 2 minutes. Stir in the carrots and parsnip and cook, stirring occasionally, for 5 minutes more, until the vegetables are lightly browned. Place the quince, the drained chickpeas, 1 ½ cups of the vegetable broth, the lemon juice, raisins, and apricots on top of the vegetables. Submerge the heads of garlic in the broth in the center of the wok. Bring the mixture to a boil, then stir in the cumin seed, ground cumin, salt, pepper, paprika, and turmeric. Pour the rice over the broth, then add the remaining 1 ½ cups broth. Cover the wok and cook over medium heat for 5 minutes. Remove the cover and stir the rice to coat each grain with broth, taking care not to disturb the fruits and vegetables at the bottom. Replace the cover and cook 10 minutes more. Then, with a chopstick make several holes in the rice to the bottom of the wok. Continue to cook the rice, covered, until it is tender and the liquid has been absorbed, 10 to 15 minutes longer. Remove the garlic and set aside. Stir the pilaf gently to avoid mashing the quince. Transfer to a large platter and scatter the minced parsley, fresh coriander, and pomegranate seeds over the rice. Display the heads of garlic prominently on top and serve. I have had success substituting a large Asian pear for the quince. Peel, core, and slice it into eight wedges. If neither quince nor Asian pears is available, try using a large, tart apple. Pomegranate seeds freeze well. When the fruits are in season in the autumn, save the seeds, wrap them airtight, and store in the freezer for up to 6 months. The traditional accompaniment to this pilaf is a plate of scallions and shredded radishes. I also like to serve flatbread on the side.